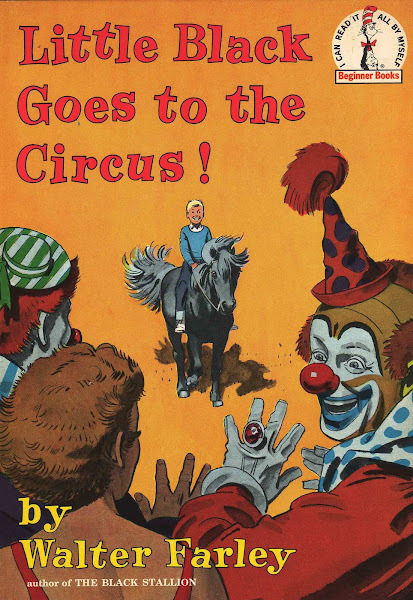 Vintage Kids' Books My Kid Loves: Update Friday: Little Black Goes to the Circus! I picked this book for an update for no other reason than that it was sitting on my desk this morning and I'm too swamped with things to do to walk into my son's room and select a fave. But this was one of the first vintage books I bought him way back when, so it's due for an update. Man oh man, do I still love the color in this book. So, it's Update Friday and I'm dusting off this post from 2007 and giving it some new scans. Please enjoy the incomparable Walter Farley's Little Black Goes to the Circus!. BTW: Having fun reading the online chatter about the recent New York Times article. I'm always up for a passionate debate over children's books. With a headline like "Picture Books No Longer a Staple for Children" there was bound to be some hoopla. LONG LIVE PICTURE BOOKS MY FRIENDS!!!!!!! Aaiiieeee, a clown....run Little Black! Head for the hills! Pity that the pressure for kids to perform is causing nearsightedness. Picture books are fantastic! I have a book about New Zealand birds which I would love to send you for your son - in appreciation of the joy vbmkl gives me every time I take a look. We have very unique birds in NZ! Let me know if this is possible and if you would like it. It was one of my favourites when I was little, and now my little ones love it too! We've also got 'Little Black, A Pony' , which is lovely too. So lovely that these books are treasured and remembered! Keep up the good work! I had this when I was little, and now my little ones love it too. We also have, 'Little Black, A Pony'. So nice that these books are still appreciated. Keep up the good work!